And then it was time for the Grand Slam once again. While we were waiting for the show to start, Riley and I were reminiscing about where we were in our lives just a year ago when we attended this event. How quickly time goes. You don't even realize how much has happened between then and now until you find yourself in a familiar environment and just about everything else is different. I've grown, you've grown. People come, people go. Things happen, things pass. I was hoping to take more photos than just this one today, but instead of holding the event in the usual theater, the slam got relocated to the new building across the street, which has a ho-hum lighting situation. We lost a bit of atmosphere and ambiance, but a powerful poem is a powerful poem. It was great to hear new works from familiar poets and also exciting to welcome some fresh faces. I always leave events like this inspired. The power of art, words, and a community to support you. 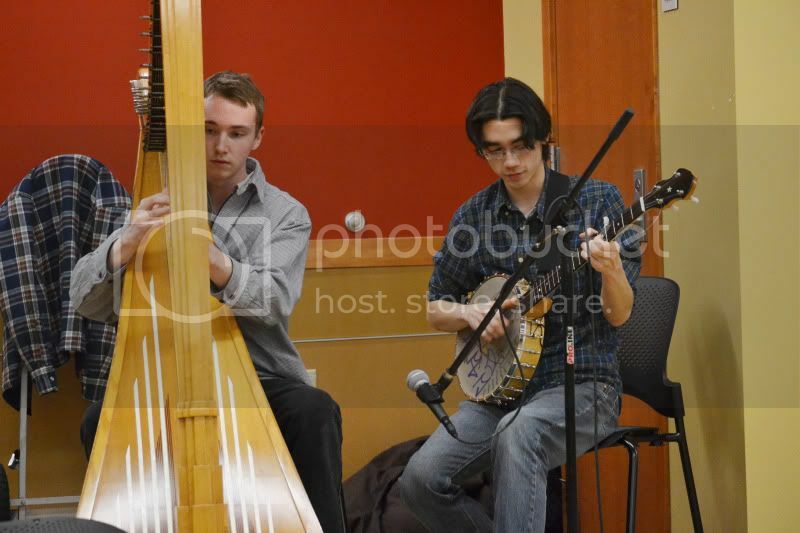 And who wouldn't be inspired by a harp and banjo duo?? Someone get me a pen and paper, stat!